The aim of this site is to document the experience of going to see pictures. It primarily reproduces eyewitness testimony of watching films, from the 1890s to the present day. The documents cited include diaries, memoirs, essays, film trade papers, newspapers, works of fiction, poems, interviews, official reports, web texts, photographs, cartoons and artworks. Texts therefore have been chosen whether they are contemporary or retrospective. The selection does not include conventional film reviews. For each document the original source is given, the text is reproduced verbatim, and a comment provides contextualising information. The decade covered, the country and the type of document are noted under categories; other subject terms are listed under tags. No distinction or qualification is made about the form of the memory recorded. All written records, and all memories, are subjective. We must interpret them as we think best. The documents are a combination of complete texts and extracts. The extracts focus on that part of the document that is most relevant to the subject of picturegoing. Extracts are also used for in-copyright works and are quoted proportionately for the purposes of criticism and review. Many of the older texts have been taken from public domain sites, such as the Internet Archive, Hathi Trust and Project Gutenberg. Picturegoing was established in July 2013 and will be built up gradually. Although initial emphasis will be on the British experience 1890s-1940s, the intention is to become worldwide in scope, and covering all time periods. The aim is to create a substantial research resource for anyone studying cinema and society, or more broadly the impact on modern lives of the visual. For most of the time, ‘picturegoing’ means going to the cinema, but the plan is to expand the brief in stages to cover other forms of visual experience. 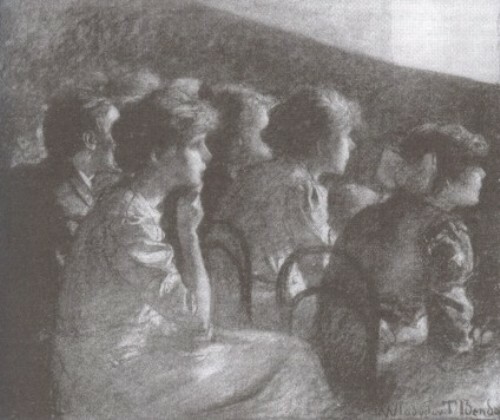 Magic lanterns and streamed theatre have begun to be included, and others could include television, illustrations, art works, exhibitions, the Web, mobile video, and so on. Cinema does not exist in isolation, and the logical extension of such a study is towards documenting the viewing experience overall. For this reason the Open University’s Reading Experience Database (which documents the historical experience of reading worldwide) has been a strong influence on this site. Suggestions for texts and images that may be included on this site are greatly welcome. For more information, see the Contact page. Anything published on this site will conform with the fair dealing provisions in UK copyright law. If you wish to contribute your own memories of picturegoing, please use the Contribute form. I cannot guarantee that all contributions will be used, but I do encourage anyone interested to help build up Picturegoing into a rich and lasting resource. Picturegoing is edited by Luke McKernan.